Cleveland’s GOODTIME III arrived at Great Lakes Shipyard earlier this month to undergo drydocking and repair work. The vessel received its five-year year US Coast Guard hull and machinery inspection and had its hull repainted. 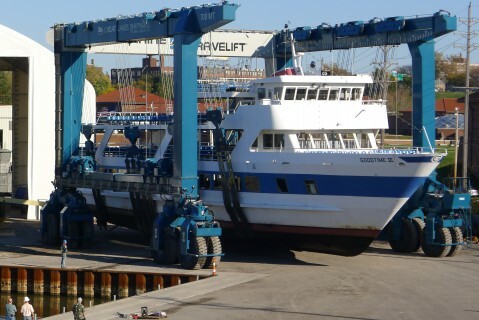 Great Lakes Shipyard has performed work on the previous Cleveland-based excursion boats, GOODTIME and GOODTIME II. This is the first repair contract that Great Lakes Shipyard has had for GOODTIME III. GOODTIME III, a family owned and operated business since 1958, is Cleveland’s largest excursion vessel and the largest quadruple-deck luxury ship on the Great Lakes with a 1,000-person capacity. It provides such trips as charters, dinner cruises, tours, etc.